It has been more than a year since I left my corporate job for a more healthy and chill life. I have applied for several home-based jobs before I landed one a month after I resigned. Joining several Facebook communities whose focus is on legit home-based jobs helped me prepare for interviews. 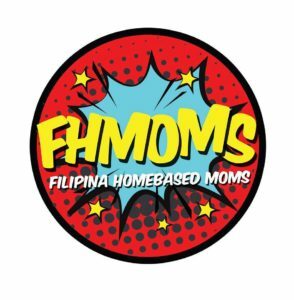 One of my favorites is Filipina Homebased Moms (FHMOMS), a group created by a Filipino mother with the mission to help fellow parents, mothers especially, to find jobs suitable to their lifestyle through onlinejobs.ph. I like how the group members share their views with working from home and even share job opportunities. They also have a line-up of seminars that you can sign-up to in case you are clueless with working from home or if you just want to upgrade your skills. 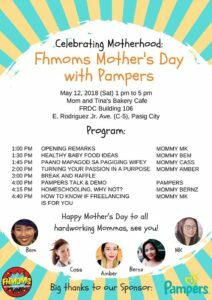 Last May 12, 2018, I was privileged to be invited to an exclusive FHMOMS event sponsored by Pampers. The event was held at Mom and Tina’s Bakery in Pasig City. It was a short yet meaningful event where speakers discussed different topics. It is really helpful to attend events like this for soon-to-be-moms like myself. My favorite topics where Healthy Baby food ideas and Homeschooling. If you are a mom planning to have more time with your family by working from home, or if you already are working from home and needs a support group, I suggest that you join Filipina Homebased Moms and follow their Facebook Page too. It always feel good to be in a group who share the same passion with you and understand your needs and frustrations. I hope you all had a meaningful mother’s day celebration!